I first encountered Shahi Tukda a couple of years ago on an Eating Out In Delhi adventure – in fact I think it may have been that very night my obsession with street food began. We’d already eaten our fill of kebabs and biryani when the group’s organiser, Hemanshu, suggested we push ourselves to the limits of gastronomic endurance with a plate of ‘bread pudding on steroids’. That first mouthful suddenly made me feel at home with Indian street food because deep within the bubbling, buttery, sweet spiciness was something very recognisable – good old British bread and butter pudding. 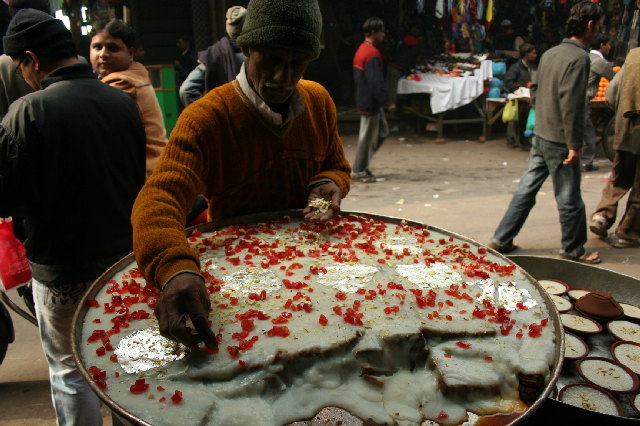 Of course, the Indian street version has evolved into its own thing: the bread is first fried in ghee before being soaked in thickened, sweetened, lightly spiced milk then topped with nuts or glace cherries and warque (silver leaf) before being left to bubble and intensify over a flame for hours on end. Since that first time I’ve eaten Shahi Tukda many times, in fact I find it difficult to pass by, especially when it’s nippy and I can kid myself I need the extra calories. I ate some from this young man in Matia Mahal one chilly morning last week – he claims there’s nothing to it but bread, milk and sugar but I suspect that old street vendor ruse of leaving out a key ingredient! The recipes I’ve found say Shahi Tukda should be served chilled but right now I’m not ready for cold – get back to me in May though and it could be a completely different story – and in any case it’s always served hot on the street and that’s the task I’ve set myself. I had a couple of attempts – the first time, I thickened the milk rather too enthusiastically and ended up with Milk Cake and had to start again. Once you get the milk right, this is extremely easy to make and even easier to eat. 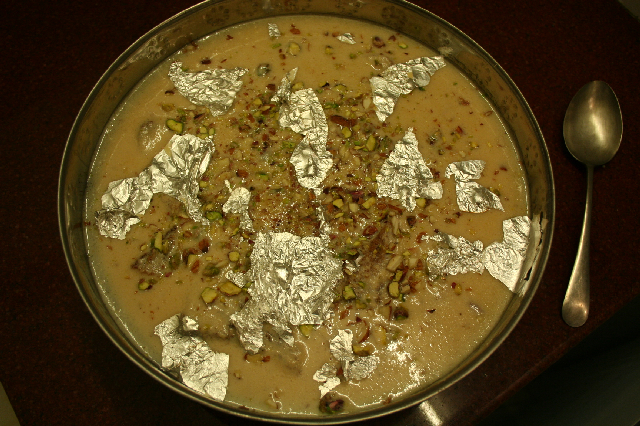 My Shahi Tukda was a paler, lighter pudding than the street version and my thickened milk soaked in rather than sat on the top but it more than held its own as a dinner party dessert – not least because its dramatic appearance belies the minimal effort involved, which could make it a regular around here. When I heated up the leftovers the next day (which I confess I did several times) it was definitely getting closer to the sticky, toffee-ish consistency of the street dish. First thicken the milk by bringing to the boil in a large pan (preferably one that doesn’t have a tendency to burn). Lower the heat slightly and let the milk bubble away till reduced by half. Keep stirring to stop the milk burning on the bottom of the pan. When the milk is the consistency of single cream and has a more buttery colour – just like tinned evaporated milk in fact – take off the heat and stir in the sugar, cardamom and kewra/rosewater. 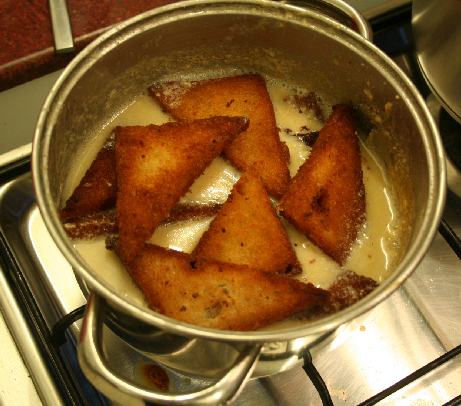 While the milk is reducing, heat the ghee in a frying pan then fry the bread until a deep golden brown. On the street stalls Shahi Tukda is quite dark so I think they fry the bread until almost burnt. When all the pieces of bread have been fried set aside. When the milk is ready put the fried slices of bread in and cook gently for 5 minutes or so. Remove the bread carefully and place in a serving dish. Sprinkle the sultanas over the bread then pour on the milk. Leave the milk to soak in some more and give a royal flourish of nuts and sliver leaf before serving. @NRN – trick, of course, is moderation – not a trick I can always manage! I gave the Shahi Tukda recipe a go in the kitchen and whilst i am no Gordom Ramsey, the results were fantastic. Thanks for the share. @bp monitors – glad the pud worked out for you – hope the BP stayed steady! We can partly replace milk with a can of condensed milk to reduce the cooking time……..but,rich creamy milk is a must to get the right texture. Have been a silent follower of your blog. I love my ghee and I do workout religiously. My philosophy is anything in moderation is allowed. @Sahiti and KR – thanks so much for following! 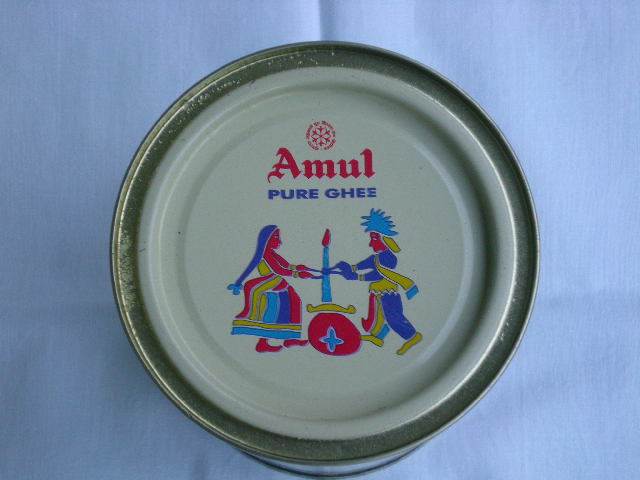 I love Ghee, but can’t seem to get any Amul in London. Would you know where I can get it? Kay – Have you tried in the Indian areas like Wembley? Sigh. It is such a gloriously decadent sweet. Now, where exactly in Old Delhi can I spot this? Hi, Pamela, We just read about you in the FT. My husband spotted it and shared it with all our friends in Scotland! We are a family who actually lived in Glasgow for three full years — albeit many years ago but still have excellent Scottish friends with whom we keep in touch! I used to know Glasgow so well. Even did a course in Glasgow University on Victorian Architecture ! Your Blog is great fun and we are somewhat foodies ourselves. We happen to be South Indians in Delhi and Delhi if I may say is only one place in India! Street food elsewhere is equally exciting! I am a lover of Ghee myself , but you have not eaten ghee unless you have it at home — in our home! We south indians make ghee differently– the process is the same but the point at which you take it of the fire is important. North Indians take ghee of the fire too soon. You have to have south indian ghee! Anyway I am going to read all your blogs now carefully! Thanks for your lovely comment. Sounds like an invitation!? I love Glasgow – great city! We’re looking forward to a few weeks in Scotland in the summer! Hi, Pamela, Of course you are most welcome! Just give me a day’s notice and we will dish out Idlis and dosas and upma for you!! And badam halwa made in pure ghee! I agree with Geeta above. Even though Amul ghee is very good, it is no match for home made ghee. Learn that and you will discover a new level altogether. Prakash – definitely on my to do list! Ghee is a wonderful ingrediant and it can be easily be made at home. All you have to do is melt high quality butter and skim off the impurities. I love using ghee instead of whole butter as it has a higher smoke point and won’t brown like whole butter will . Neil – yes, ghee is my new go-to fat…..lets hope all those stories about its health-giving properties are right! Please try the different styles of ghee while you are in Delhi. As Smt.Geetaji indicated, regional styles vary. Ghee is “melted butter” but HOW that butter is made makes all the difference. In Europe or cold climates, cream is allowed to rise to the top of milk and psychrophilic microbes [those flourishing below 50F] are allowed to work on this separated cream to produce the diacetyl and other flavor compounds that create quality cultured butter. This is NOT “sweet cream” butter, which in Sanskrit is termed “anAyAsa”, meaning “with little effort” as opposed to the “navanIta” the cultured butter churned either from yogurt or from fermented clotted cream. The microbes in yogurt are heat-loving, 112-116F setting yogurt best. North, South, East India, all have unique mixes of yogurt microbes, and the Central Food Tech. Research Inst. Mysore, has researched & standardized these cultures. They can be purchased by name, e.g. South Indian yogurt mix!!! The ghee flavor profile is slightly different from place to place, & certainly with cow & buffalo milk. I can recognize the Vrindavan, the West Bengal, the Sikar district (Rajasthan) and Pokhara (Nepal) just as salmon fry recognize their natal stream by taste & smell. I am told that the Gir cows of Gujarat produce a signature ghee, as do the Vechur of Kerala. The list is endless. You may purchase LAKSHMI brand ghee from Chittaranjan Park or Karol Bagh or any Bengali enclave and see what a commercial Bengali product tastes like. Do go to Vrindavan, & I shall ask some friends to get you pure cow ghee made the traditional way. You will never touch Amul again! Try some tinned brands from South India & Maharashtra, too, and note the differences. If you can find it, please try ROORKEE BUTTER, a white buffalo milk butter sold near Dehra Dun. 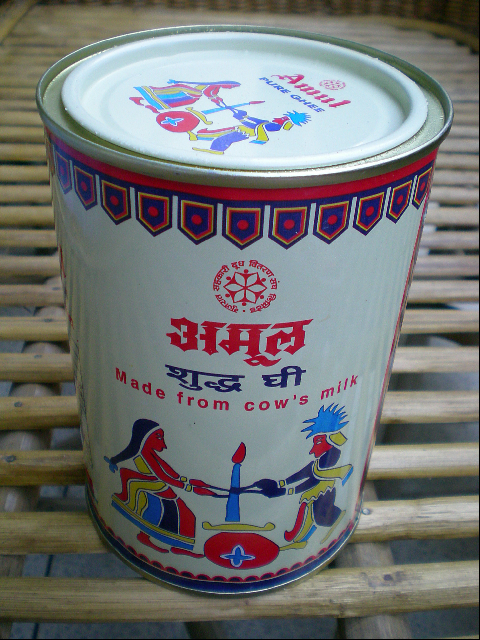 Nothing sold in tins by any dairy coop is DESI GHEE, i.e. churned from yoghurt. Please ask your Indian friends in the food business to get you PURE DESI GHEE. It should have a coarse, grainy feel to it, and a characteristic powerful toasty aroma, slightly smoky. Where can i find the yogurt starters from Central Food Tech? 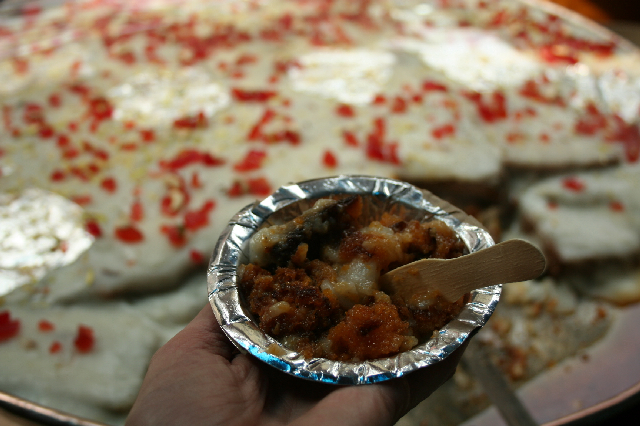 I have a Shahi TukRa date but I didn’t know where to take him in Old Delhi–I know that he won’t settle for anything but the best. I’m glad I came across your post; now I know where I’m going to take him when he’s in Delhi next. I’m just curious about one thing – the man in the photograph looks middle-aged to me (in his 50s maybe), but you call him ‘young man’. Is he the same street vendor you’re talking about in your post? Hi where is the best Shahi Tudka? I will be in Delhi in a couple of weeks- I guess it is somewhere in Chandni Chowk? ?